The perfect greek pork chops recipe! Golden and crusty on the outside and perfectly tender and succulent on the inside. This is my favourite Greek brizola recipe (Greek pork chops recipe)! The secret behind this pork chops recipe is the marinade. The pork chops are bathed in a Greek-style marinade of olive oil, red wine vinegar, red onions, garlic, black pepper and generous lashings of dried Greek oregano! Seared on a hot pan to get golden and caramelised and then oven-baked, covered and sealed with parchment paper, along with garlic lemon potatoes in white wine. This Greek pork chops recipe is best served with a big bowl of tzatziki, a side of toasted pita bread and Greek feta salad for a complete generous Greek style meal! Of course the best option is to grill the brizola (Greek pork chops) on a char-coal barbecue, to get them all crispy and smokey. 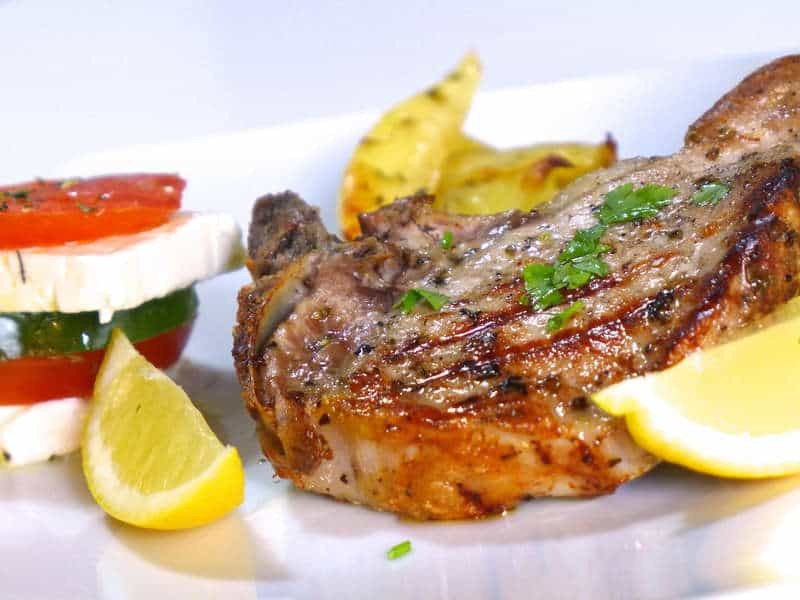 However if you don’t have the time or space for a proper barbecue, this Greek pork chops recipe is suitable for frying and oven-roasting. For this Greek pork chops recipe use some bone-in pork chops, as the bones tend to make the meat juicier retaining the moisture inside. Pork chops are a quick cooking cut of meat, that is very easy to overcook. In Greece when preparing Greek pork chops (brizola) it is an unwritten rule to roast the potatoes in the same pan with the pork chops so that they soak in all the juices and aromas from the meat. But then, potatoes and pork chops don’t cook at the same time, so start roasting the potatoes first for about 45 minutes. Start the pork chops on the pan, where they get a good sear and then transfer them in the roasting pan with the potatoes to finish cooking. Searing the pork chops, will give them that wonderful golden crust on the outside and seal the juices inside. A lot of people are afraid that oven roasting the pork chops will make them dry, but the fact is that the gentle heat of the oven helps us to control the rate of cooking a little better and prevents the outside from getting tough and dry before the middle has finished cooking. If you have thermometer then use it at the thickest part; when the pork chops are done it should register 62 C/ 145 F. Finally, after done cooking, don’t forget to tent the pork chops loosely with foil and and let rest for at least 5 minutes. The pork chops are still cooking from the heat. If you try cutting them right away, then all the juices will come out and the meat will dry. To prepare this Greek brizola recipe with roast potatoes (Greek pork chops), start by preparing the marinade. In a large bowl add the roughly chopped onions, the garlic slices and the pork chops (brizola). Drizzle with olive oil and red wine vinegar and season with salt and freshly ground pepper. Sprinkle the pork chops with oregano and blend to coat. Cover the bowl with plastic wrap, chill and let marinade for 1-2 hours. Cut a large piece of parchment paper and soak it with water. Squeeze to get rid of the excessive water and line on a large baking tray. Place the potatoes on the parchment paper, drizzle with olive oil and lemon juice, pour in the white wine and season with salt. Sprinkle the potatoes with oregano and minced garlic. Cover with a large wet piece of parchment paper and join the edges together to seal. Bake at 180C for about 45 minutes. Now it’s time to get some colour on the pork chops. Heat a griddle pan over high heat and sear the pork chops for about 1 minute on each side, until nicely coloured. Turn the baking tray out of the oven. Uncover the parchment paper and place the pork chops over the potatoes on a single layer. Cover again to seal and pop back in the oven for about 10-15 minutes, depending on the thickness of the pork chops. Remove the baking tray from the oven, unwrap and remove the pork chops. Cover the pork chops with aluminium foil and let rest for 10 minutes. Bake the potatoes uncovered for about 15 minutes, until nicely coloured. Serve while still warm. Enjoy! In the front cover list of ingredients, dried marjoram is listed, but on the actual instruction page, it lists dried oregano & no marjoram. I’m assuming it’s a misprint in that oregano is more traditional in greek cooking and therefore is the correct ingredient. why white wine for potatoes? This is quite simply the best recipe for pork chops I have ever tried (and I’ve tried many). Beautiful, tender and full of flavor. A big thanks to the contributor! Just like how my family used to make! Love these! Thank you for publishing!